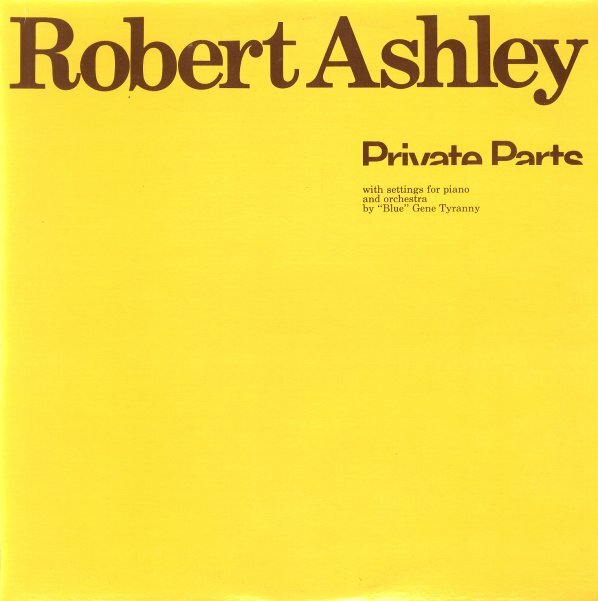 One of the most important records from composer Robert Ashley – and one that's got a compact approach that helped it circulate a lot more than some of Ashley's larger operas! This piece is very much like those – with Ashley's unique spoken approach – part poetry, part performance art – but the sound is more stripped-down, and in the spirit of the young downtown New York generation of Laurie Anderson and Phillip Glass – served up with great instrumental help from contemporary Blue Gene Tyranny, who plays piano, moog, and clavinet – with some additional tablas for accompaniment! The whole thing was recorded at the important Center For Contemporary Music on the west coast, at Mills College – and is almost a Bay Area answer to some of the more compelling art records from the New York scene. The record is divided into 2 parts – "The Park" and "The Backyard" – both filled with a hypnotic mix of voice, keyboards, and tablas! © 1996-2019, Dusty Groove, Inc.